February 20 is still the height of summer in New Zealand. Nevertheless, on that date we hiked the hour or so from the carpark to the front of the Franz Josef Glacier, which is located in the Southern Alps half-way down the western side of the South Island. Before we’d gone too far along the trail I stopped to photograph the still-distant glacier. Europe and North America have their glaciers, but none that I know of are within sight of tree ferns. They were an excellent accompaniment to the first glacier I’d ever seen in person. I don’t keep my glasses on when I take pictures. You’re welcome. I hope you’ll make it to New Zealand if you haven’t yet been there. Yes, its my plan to see it – one of my favorite countries, a really beautiful country. Then happy travels to you. They are long time residents of those valleys. What a nice view. 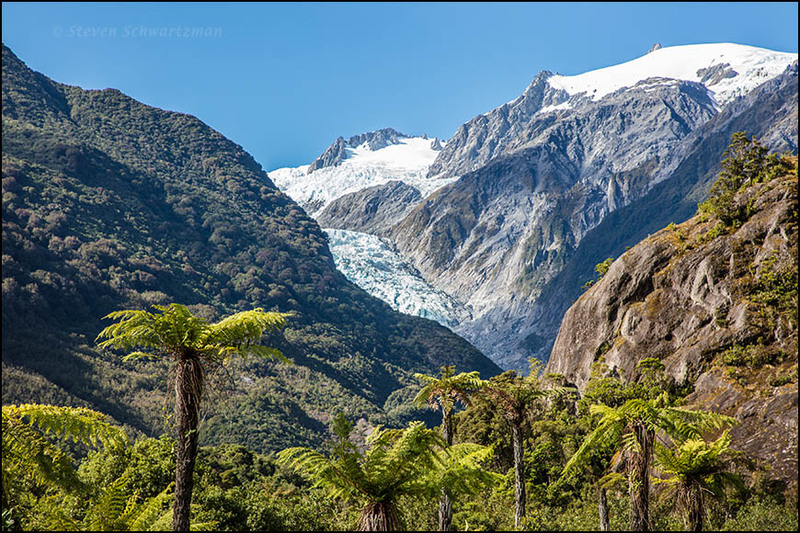 Yes, they are long-time residents there, not only of the glacial valleys, but of so many other ecological regions in New Zealand. Too bad we don’t have any tree ferns in the United States. I saw my first glaciers in Alaska, where the view was quite different from this. In fact, at first glance this seems unreal, artificial: like scenery for a low-budget film. But with a longer look, things begin to fit together, and astonish. There are places in New Zealand (and California, too, now that I think of it) where people have planted alien palm trees that have indeed made the landscape look fake. You can be forgiven if today’s picture gives you that impression—and yet the view is authentic and indeed unique. I’ll follow up with much closer looks at the glacier, but I’m glad I took this picture from far away. I appreciate this distant, ferny view more now that I see the image than when I took it. By the way, Alaska is one of the four states I haven’t yet visited. You’re fortunate to have made it there. Did you feel a cold breath of air coming down off the glacier? I’ve never seen one in person. The juxtaposition with the tree ferns is magnificent. No, I don’t recall feeling a cool breeze coming from the glacier. Perhaps I would have if I’d gotten closer, but for safety the trail stops short of the glacier. I did spot one person who wandered way past the barrier and got close to the glacier, but I never saw him after his presumed return to the trail to ask him what he experienced. Even without a glacier, tree ferns are wonderful. I hope you’ll get to experience some. I’ve been right up to the face of the Fox Glacier and was able to hike to within a few feet of the mouth of the cave from which the Fox River emerged, and I remember clearly a bit of trepidation while trusting my luck that a chunk of the ice wouldn’t calve off above me. But that was 20 or so years ago, and I’m pretty sure they will have put up safety limits to help to protect silly thrill-seekers and adventurous photographers from being able to get that close. But oh, what a feeling! You’re fortunate to have seen the Franz-Josef! After we’d hiked to the end of the trail I noticed one guy who had gone a good quarter of a mile past the barrier and was walking around near the front of the Franz Josef Glacier. At no time did I see a guard or policeman who would keep people from walking beyond the barrier, which is just a simple rail fence that’s easy to scoot under. There was, however, a cardboard cutout of a guard with one hand raised, for whatever good that did. I took a picture of Eve posing by that cutout. In any case, you’re right about our being fortunate to have visited the glacier. On the previous trip we got tantalizingly close when we visited Hokitika, just two hours north, but by then we were running short of time and had to swing back north. You are a master, Steve! Thank you for sharing this. I envy you and Eve your travels. Thanks, Libby. We saw a lot on this trip but we also got exhausted. It was, but hundreds of other people walked the trail that morning. I love this photo Steve. I am glad you managed to keep the hundreds out of the scene. When we visited the glaciers in the 1960s there were very few people. I should have felt lucky to see the glacier region so devoid of people. Instead I felt scared by the eerie silence. Kids! You’re fortunate to have seen the glacier in relative solitude, even if it took till much later for you to appreciate it. We visited on a pleasant day in summer, so the crowd was unavoidable. The carpark at Milford Sound was even more crowded. We’re still glad we went to both places. I visited Milford for the first time in about 2005 (I think); it was quite crowded. But the landscape made the people seem insignificant and tiny. Yes, it’s a grand fiord with lots of native bush. The boats (and even one cruise ship) were indeed tiny by comparison. That’s one thing that makes the South Island of New Zealand unique. it seems so strange to see ferns or palms against a backdrop of ice/glaciers… near chimborazo,the city of guaranda has beautiful stately palms…..
i saw in the news this morning that the area near riobamba had hail.. so much that they called it an ice storm.. the streets and highways are a mess and of course there are accidents. I thought about you because you’d earlier confirmed tree ferns in Ecuador. That made me think there’s probably a place in the Andes where you can see tree ferns and a glacier at the same time. The juxtaposition of the two in New Zealand certainly caught my attention. Speaking of hail: twice in the 13 years we’ve lived in our current house in northwest Austin we’ve had bad enough hail that we ended up getting new shingles on the roof (and once a new skylight).